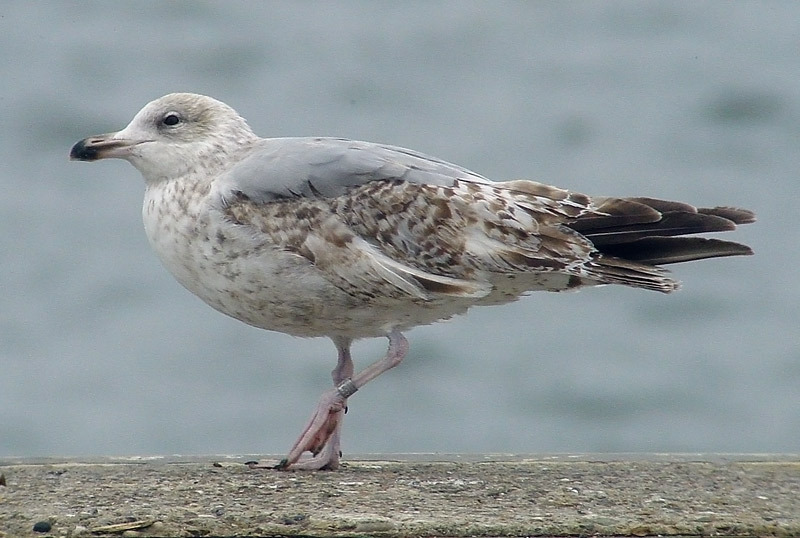 9 images: Herring Gull 5.412.501 (argenteus), September 2003 - September 2004, IJmuiden, the Netherlands (52.27N-04.33E). A 2cy argenteus with a Dutch ring: Vogeltrekstation Arnhem 5.412.501; ringed as "fledged 1cy" on September 09 2003 at IJmuiden (52.28N 04.35E). It was held in captivity for more than 24 hours. The ringer aged this bird 1cy, an easy mistake considering the pattern on the wing-coverts, which is still very first generation like. From late April onwards, argenteus has a complete moult during summer to so-called "second winter" plumage. This complete moult will be finished by October. The head has been moulted in July-August and shows neat fine streaking by October. 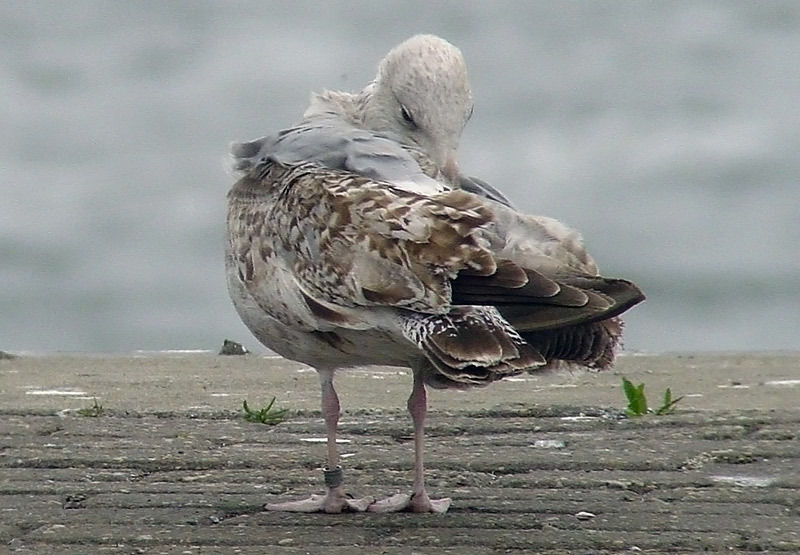 The under-parts and rump are pale, mottled with brown. From mid-May, the scapulars and mantle were replaced for third generation feathers, starting with the replacement of the lower upper scapulars. The pattern of the third generation scapulars is more or less similar to the anchor pattern of the second generation feathers. In argenteus, some new scapulars may appear adult-like pale grey, but most new feathers will show an anchor pattern and this still applies on the new feathers in September. By September, 2cy argenteus is actively moulting the lowest scapulars, but in the mean time, the upper scapulars may be moulted again as well. Fresh feathers can be recognized by the buffish centres. From early April, the inner primaries were shed and new second generation primaries grown in. On average, the last juvenile primary (P10) was shed in the first week of August. The majority of argenteus complete the primary moult by the first week of October, when the new second generation P10 will be fully grown. The new primaries are dark with a tiny pale tip on the fresh flight-feathers. The four inner primaries show an extensive pale window, as both inner and outer-web are pale greyish white-brown, contrasting with the outer-wing. A pale inner-web can still be found in P7. The second generation tail-feathers show a clear-cut blackish tail-band with only isolated blackish markings on the white basal half. From late April to September, argenteus replace the wing-coverts and tertials, finishing with the central greater coverts and outer lesser coverts. By September, the average 2cy argenteus start a simultaneous partial autumn moult in the wing-coverts, including the upper tertials, some median and lower lesser coverts and often the inner greater coverts. Arnhem 5.412.501 has primary P9 fully grown. The partial wing-covert moult didn't start yet, since the inner greater and inner median coverts are still present. In general, this is still a very 'barred 2cy individual'. top image: Herring Gull 5.412.501 2cy, September 22 2003, IJmuiden. 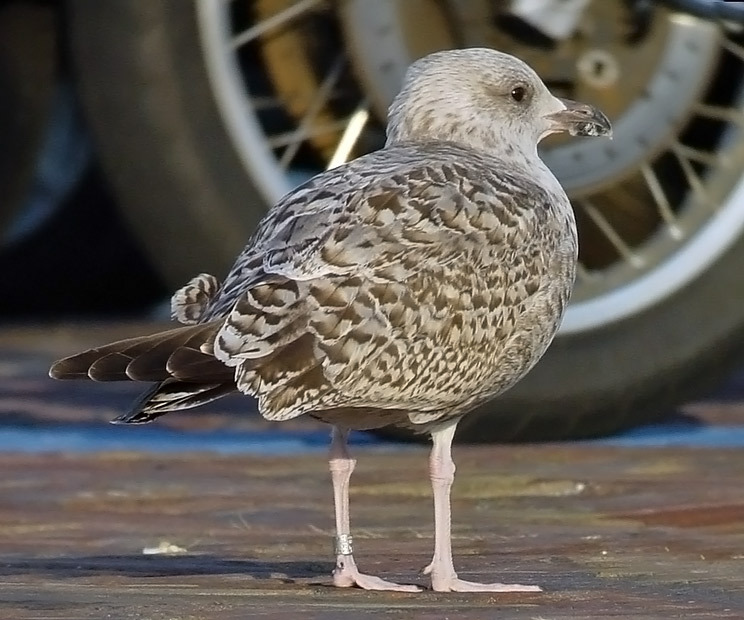 2 images below: Herring Gull 5.412.501 2cy, November 11 2003, IJmuiden. The complete moult in argenteus is finished by late-October and overlaps with the partial autumn moult which starts in September and often include scapulars, a few inner wing-coverts and upper tertials. The head shows neat fine streaking and the under-parts and rump are pale, mottled with brown. The scapulars and mantle are replaced for third generation feathers, finishing with the replacement of the rear lowest scapulars. The pattern of these third generation scapulars is more or less similar to the anchor pattern of the second generation feathers. Simultaneous with replacement of the lowest scapulars, argenteus moult some of the lower upper scapulars in November. By October, argenteus the new scapulars may appear adult-like pale grey or grey-based. By late-October to November, argenteus has finished the primary moult. The second generation tail-feathers show a clear-cut blackish tail-band with only isolated blackish markings on the white basal half. 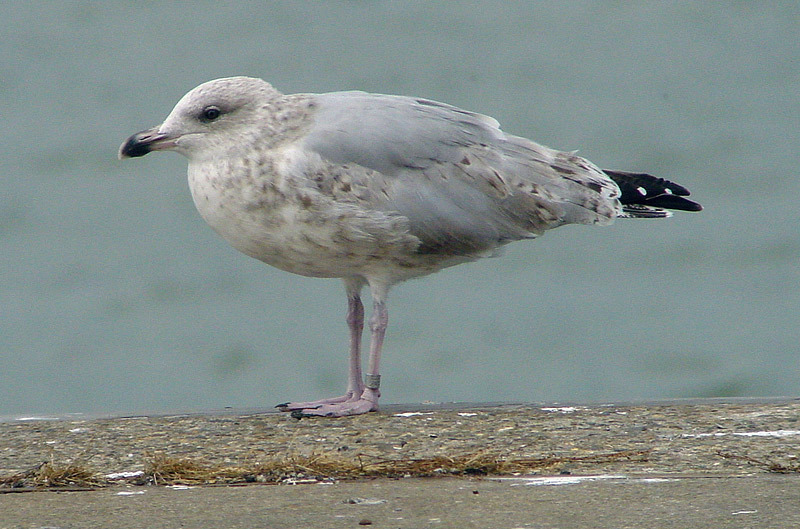 image below: Herring Gull 5.412.501 3cy, March 20 2004, IJmuiden. 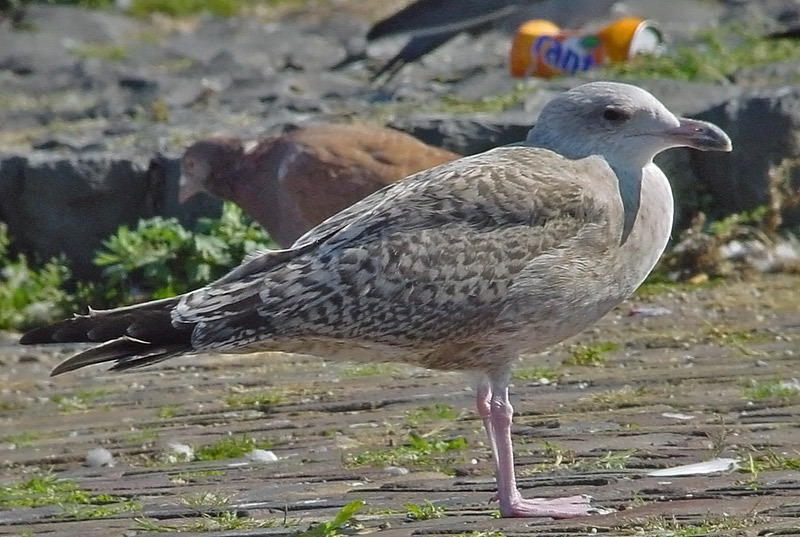 2 images below: Herring Gull 5.412.501 3cy, May 11 2004, IJmuiden. 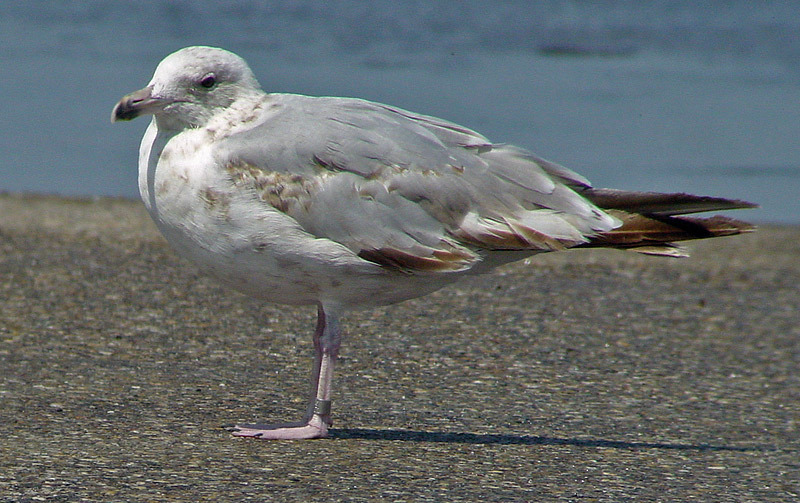 2 image below: Herring Gull 5.412.501 3cy, July 09 2004, IJmuiden. 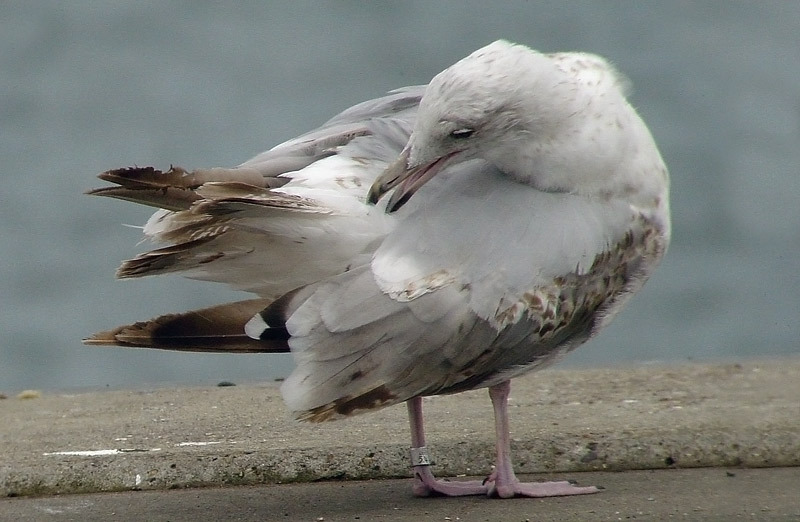 1 image below: Herring Gull 5.412.501 3cy, September 18 2004, IJmuiden. From June to October, a complete moult will bring 3cy argenteus in so-called "third winter" plumage. By September, when the complete moult is (almost) finished, the head will show extensive 'winter streaking', mottled brown contrasting with the white breast as in an executioner's hood. The scapulars and mantle are pale adult-like grey, although some individuals may show an immature pale brown hue on the lower scapulars. By the end of the complete moult (October), all wing-coverts have been replaced, most to plain grey feathers. Immature patterns can often be found in the lower tertials, greater coverts and outer lesser coverts (the carpal edge). During the 3cy summer, the primaries are moulted to third generation. The first inner primaries are dropped by late May and the outer primary P10 will be dropped by late August. The primary moult is completed by late-October in argenteus, when the new outer primary P10 is fully grown. The table below shows some September data from Scheveningen harbour. The third generation primaries are clearly adult-like, with the inner primaries P1-P4 plain grey with a white tip. The outer-wing shows a clear black triangle, extending on the greater primary coverts. From P4 outwards, the primaries show a black sub-terminal band. The white primary tips are obvious in the inner primaries, but only poor developed on P9 and P10. P10 has a small white mirror (lacking in some birds). The new tail-feathers will be white, with clear immature black markings. The iris turns pale yellow in summer (from July onwards). 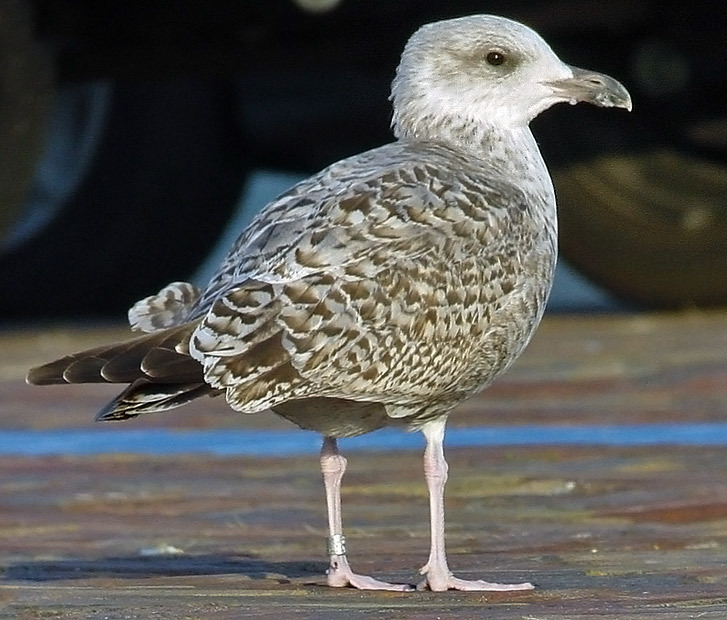 September primary moult scores in 3cy Herring Gulls at Scheveningen. 6 11 1 . . . .
10 . . . . 1 . 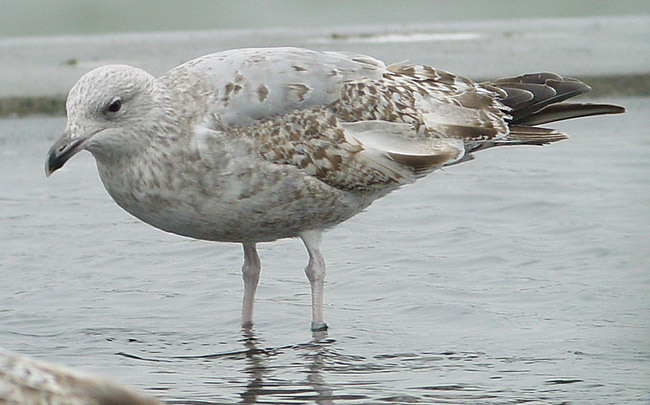 By September, local argenteus get company from argentatus from Norway, which have on average lower moult scores and from argentatus from the Baltic region, which have equal moult scores probably. 95% CID: Confidence Interval of the Difference.